Wash the sunchokes, cut them up so that the pieces are matched for size, otherwise they will cook unevenly. 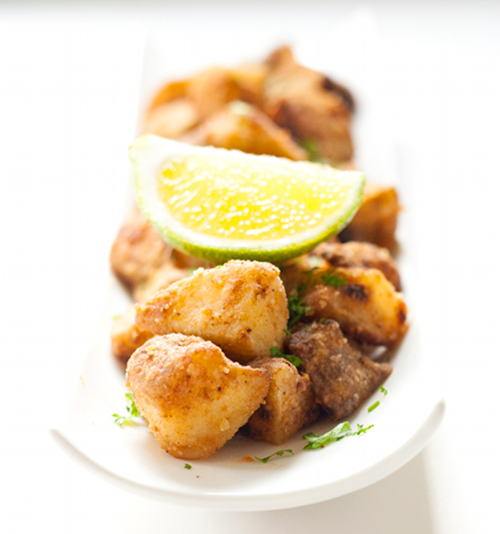 Drop the pieces immediately into water mixed with lime juice, to prevent them from browning. Preheat the oven to 350 degrees F. Bring a pot of salted water to boil. drain the sunchokes from the lime water and boil them for 3 minutes, or until slightly tender. Remove chokes from the pot and drain. Mix the flour with salt and pepper, garlic and onion powder, celery powder, oregano and cayenne pepper in a plastic gallon bag. Shake the bag until all the ingredients is well combined. Melt the butter in a roasting pan, coat the sunchokes in the seasoned flour and roll them around in the butter in the pan. 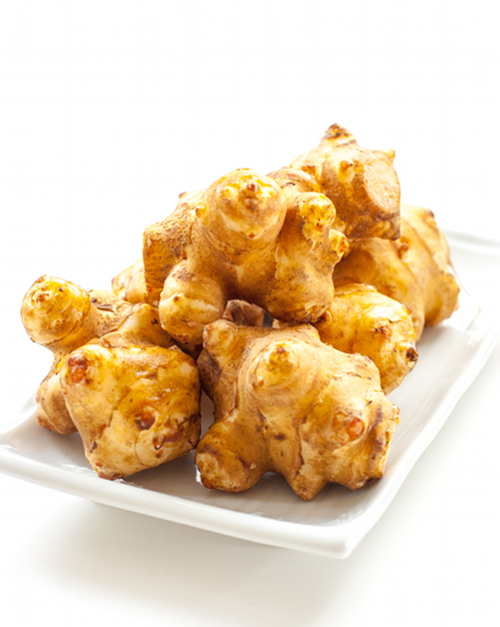 Cook the butter and flour coated sunchokes in the oven for 20-30 mints, or until golden brown. 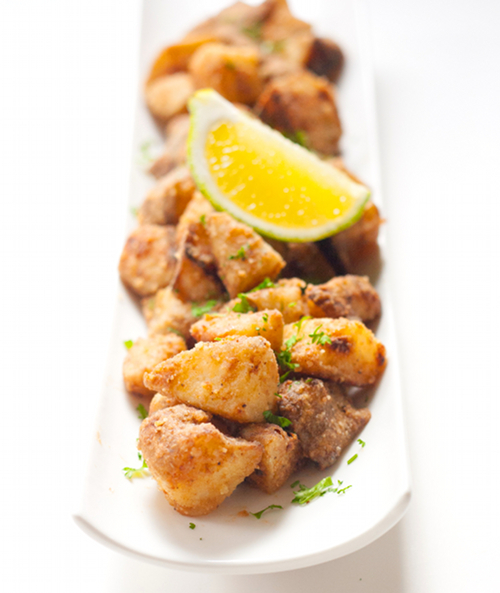 Sprinkle with chopped parsley and squeeze some lime juice over the sunchokes, if desired. Serve immediately. I love sunchokes--such an ugly little vegetable but SO good. These look delicious! These look great. I hear about sunchokes so much on The Food Network shows that I finally bought some just to see what I thought. I only quickly boiled them like potatoes to get an idea of the flavor and it was good. Roasting them properly, the way you did, is next on my list. I've never had a sunchoke before, but I love all of the other ingredients, so I'm sure I'd like this! Hope you're having a nice weekend! Oht hese look wonderful, I have never had them before. Sounds delicious I am going to have to look for them. Have a lovely weekend. Oh wow these look so good! i've never had a sunchoke before, but the flavors sound delish. The way I would describe the flavor is the cross between artichoke and potato, it's absolutely delicious. This looks delicious - I've never had sunchokes, but I really want to try them! What a great looking dish. Yum, yum, yum! Usually I boil them a little before frying them in butter in a pan, but I'll definitely try your recipe!